I’m sure you guys know I’m a big fan of Eat This Not That. It has been a great assistance to me through this weight loss journey. None of us like to admit it, but a lot of us lost our way and to some degree we forgot how to eat healthy and started eating to please our palates instead of eating to fuel our bodies. This is not to say you can never indulge but when every day and every snack and meal becomes about making your tongue happy regardless of how crappy the food is you have indeed lost your way. Anywho… most of us wouldn’t even consider that anything from McDonald’s would clock in for lower calories or fat in comparison to a bagel with cream cheese but the proof is in the pudding (stats) but do not get confused though. More often than not I’ve found that people interpret these covers too simply. It’s saying the Egg McMuffin specifically has less calories and fat than a Dunkin Donuts Bagel with Plain Cream Cheese. THIS DOES NOT MEAN it’s better to eat at McDonald’s than Dunkin’ Donuts. Too many times I’ve seen people interpret Eat This Not That articles or suggestions this way. If you go to McDonald’s and order the Sausage, Egg & Cheese McGriddle you have done yourself no favors. 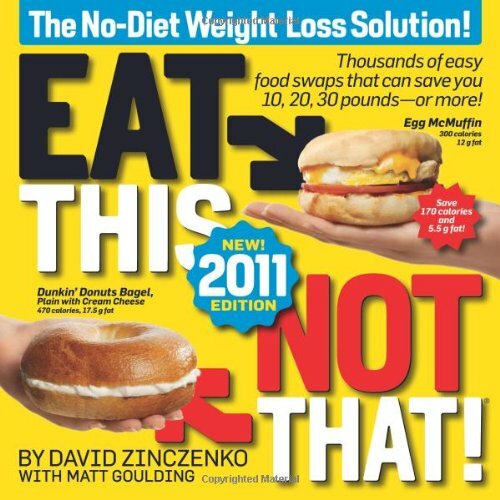 In fact you have just topped the Dunkin’ Donuts Bagel by about 100 calories and 14 grams of fat. So don’t bend this advice to suit what you want, you need to take it at face value! Below you will find a great Eat This Not That list to add to your collection. Click on Number 1 to see the rest! Despite diet experts and new research constantly telling you otherwise, many people still consume the bulk of their calories in two or three large meals each day, often—in an attempt to slim down—going for hours at a time eating nothing in between. Sure, you can lose weight on a reduced-calorie three-meal plan, but you can’t make your body burn fat more efficiently, which is key to long-term weight loss. A nutritious meal or snack about every three hours keeps blood-sugar levels stable, feeds your body a steady stream of necessary nutrients and helps control hunger-induced cravings for less-than-slimming snacks like sweets and fats. It also leads to more effective glycogen storage in the liver and muscle tissues, ensuring your body won’t cannibalize muscle as an energy source during your workouts. So make your meals mini and spread them out. If you have trouble fitting in extra eating times at work, prepare food ahead of time that you can zap in the microwave or eat cold. And stock your kitchen right: Shed fat in just days with these essential 9 Flat Belly Superfoods! Sipping this with your a.m. meal could be especially helpful if you’re a morning workout person. Consuming a caffeinated drink an hour before you start sweating can crank up your calorie burn by about 15 percent. Finding foods to fit into your weight-loss diet can be challenging, but bananas make a perfect fit. Bananas are naturally sweet and can help curb your sweet tooth if you get that afternoon sugar craving. Loading up your breakfast with protein can help curb hunger later in the day—and may mean you eat fewer calories at lunch. So whether you prefer this protein-rich ingredient scrambled, fried, or poached, it’s a smart idea to eat them first thing in the morning. These little guys are loaded with antibiotics—and by packing your diet with nutrient-rich foods, you can lose weight without worrying about calorie counting. Strawberries (and all berries) satisfy your sweet/sugar cravings, and they boast a very impressive nutrient profile.